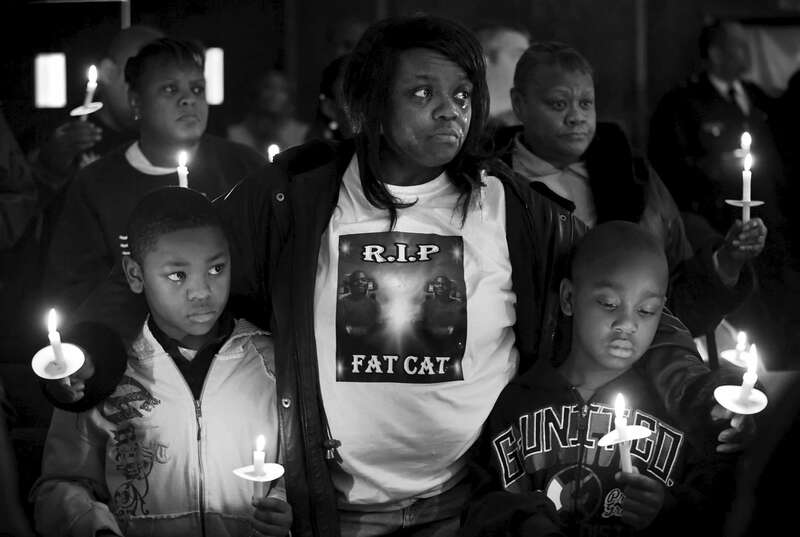 Thursday December 31, 2009--Byron Blassingame Jr., left, and Darrion Bassingame Jr., right, are comforted by their grandmother Jacqueline Heard, center, as the names of the 145 murder victims from the city of St. Louis are read aloud during the 18th Annual Families Advocating Safe Streets candle light service to remember 2009's murder victims at El Bethel Church of God in Christ on Thursday in St. Louis. Heard's son Byron Blassingame Sr. was shot and killed along with two other men in the same SUV as they were waiting at stop light near Union Station on May 8, 2009. Byron Jr. was Byron Blassingame Sr.'s son and Darrion Blassingame Jr. was his nephew.